For a long time, Microsoft reigned supreme in offices around the world. They used Exchange for email. They used Active Directory for their directory. On the strength of these three legs, Microsoft has sat high on its stool. But that stool has begun to stoop, with two of the three legs seriously weakened. Microsoft is no longer a monopoly in the operating system business or with the productivity suite. Microsoft Office has lost millions of businesses who are now using Google Apps for work. Microsoft Exchange once dominated, but now the majority of mid-sized companies host their email with Gmail. So what’s stopping Microsoft from falling off its shaky perch? They’ve been leaning on Microsoft Active Directory. Corporations and established companies are still using Active Directory. In fact, we can argue that Microsoft’s last remaining monopoly position is with AD. A directory is just such a core part of the infrastructure that managers and IT admins alike have been tentative to make a major change. But in 2015, something is different. I’ll explain what exactly this game-changer is later in this article, but for now I want you to understand what has been holding Google back from kicking out the third leg of Microsoft’s stool. Google’s credentials are some of the most widely used in the world. At many organizations, Google Apps is the one IT service that every singles user has. So IT admins have been daydreaming about the obvious for a while now: using Google Apps integrated in with your core identity management. It would essentially solve the IT identity crisis. It’s a missed opportunity for Google and IT both. Google has done a lot right with Google Apps too. They’ve invested a huge amount in infrastructure. They have a compliant infrastructure with SSAE 16 and ISAE 3402 auditing industry standards under their belt. That infrastructure is a solid and secure foundation – one that a directory could be built upon. And Google Apps’ biggest saving grace? That would be APIs. Note: See our “Benefits and Risks of SaaS Apps” Infographic for more on SaaS.Does that Mean Google can take on Active Directory? The short answer is yes. Google has already undermined Microsoft’s standing in email and productivity apps and the same trends are at work with Active Directory. Everyone knows that while history may not repeat itself, it often rhymes. The best way to understand what’s going to happen to AD is to quickly walk through how Exchange and Office fell. Then we’ll introduce the SaaS providers that, coupled with Google, now threaten Microsoft’s AD monopoly. Exchange was introduced over two decades ago, in 1993. It grew and evolved along with the Internet during a time when Microsoft was becoming the defacto standard for business computing. 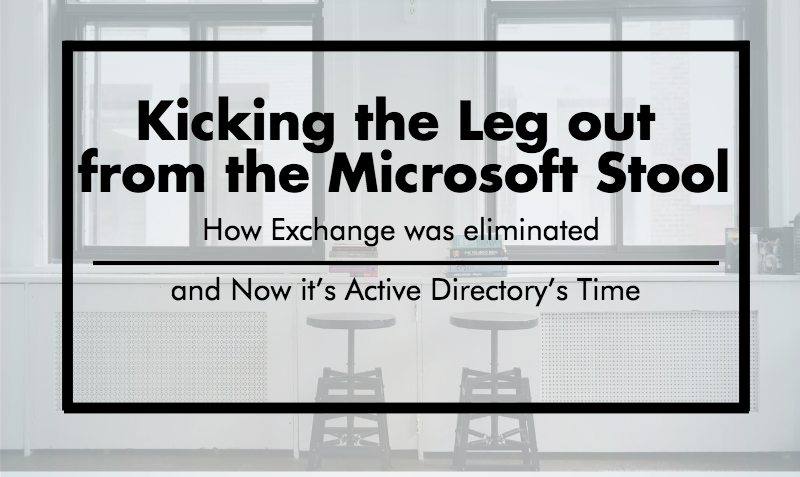 The directory initially used to host Exchange Server, but eventually became Active Directory. Gmail launched on April Fool’s day 2004, with 1 GB of storage. During a time when most email services were paid for, Gmail followed in Hotmail’s footsteps as a free email client. At that time, Hotmail, AOL, and Microsoft Exchange all had a huge lead on Google in the email game. It didn’t last. By 2012, Google supplanted Hotmail as the most popular email service in the world, with 425 million unique users per month. Even so, Microsoft Exchange was still deeply entrenched as the leading corporate and business email provider. On July 7, 2009, after five years, Google finally removed the ‘beta’ tag off of Gmail. Rajen Sheth, then senior product manager explained that part of the reasoning had to do with making a statement to the business world. “We’ve come to appreciate that the beta tag just doesn’t fit for large enterprises that aren’t keen to run their business on software that sounds like it’s still in the trial phase,” he wrote in a blog post announcing the change. Why did it take Gmail so long to get out of beta? It’s because Google always sees room for improvement. This is the exact attitude that has kept Google’s products on the cutting edge. The proof is in the pudding. A 2013 analysis from Cloud Sherpas found that Gmail beat Microsoft Exchange in availability. For every one minute of downtime for Gmail, Exchange was unavailable for 103 minutes. Today, Gmail for Work boasts 99.9% guaranteed uptime, no ads and 30GB of storage. There’s also 24/7 support by email or phone. The result is that Gmail has been a big hit with new companies on the way up, including Twitter, Dropbox, Square, and Uber. We use it here at JumpCloud too. As we mentioned before, the majority of mid-sized businesses use Gmail and a whopping 92% of Y Combinator startups are on the Google Email bandwagon. So Why is Microsoft Exchange Still on Top? In 2014, Gartner analyst Tom Eid predicted that enterprise email would be a $5 billion global industry in 2015, growing at a rate of about 10%. He estimates that Microsoft still commands 75% of the market’s spending, compared to around 4% for Google. The startups of today may be the industry titans of tomorrow (that’s something Google knows firsthand). But in the meantime, the world’s biggest companies are still favoring Microsoft Exchange – in spite of more downtime and less versatility than Gmail. The reason, once again, is Microsoft Active Directory. As long as Active Directory remains entrenched in enterprise, Gmail will always play second fiddle to Microsoft Exchange. Bill Gates first introduced the world to Microsoft Office on August 1st, 1988. The first edition included three applications, Word, Powerpoint, and Excel. During the 90’s, they became household names. By 2012, Office had a whopping one billion users. Google Apps was not as robustly featured as Microsoft Office, but being cloud-based was a game changer. Businesses that moved to Google Apps found increased collaboration, better accessibility, and vastly streamlined workflows. In the coming years, Google added Slides, Forms, Sites, Calendar, Drive, and Hangouts to the tool kit. Google announced that Google Apps was out of beta in 2010. At that time, Google Apps was being used by about 1.75 million companies worldwide. Impressive? Yes, but not in comparison to Microsoft’s market share. A 2010 Forrester report, estimates that 81% of companies were running Office 2007 at the time. That figure doesn’t even include companies that are running older versions of Microsoft Office. In December 2012, Google announced that organizations with more than 10 users were no longer eligible for the free edition of Google Apps. They would have to sign up for the paid version, now dubbed Google Apps for Work. By then, the writing was on the wall. If Microsoft was going to continue to rule the world of enterprise applications, they would have to meet Google on their playing field: in the cloud. On average, Google Apps organizations are experiencing cost savings of 41% while organizations using Office 365 experience cost savings of 27%. 84% of large enterprises using Google Apps experience increased collaboration compared to 72% of Office 365 enterprise organizations. Overall, Google Apps admins are more satisfied with features such as third-party product integrations, integrations with the suite itself, file security, storage value and usability, when compared with their Office 365 counterparts. Google Apps is more reliable and more affordable than Office 365. But while more than 5 million businesses have “gone Google” for apps, but cloud service company Okta announced that Office 365 recently surpassed SalesForce as the most popular app amongst their customers (Google Apps for Work isn’t far behind at #4). Microsoft may still be on top of the productivity software world. Again, cloud technology disrupted one of Microsoft’s core competencies and, again, they benefit from the inertia of established companies. But Google has certainly weakened the position of Office. More than anything, Microsoft’s position has been fortified by the resilience of Active Directory. 90% of Fortune 1000 organizations use Active Directory. But AD hasn’t exactly aged well – and IT departments are hoping that Google can bring its commitment to innovation and mastery of the cloud to the directory space. Microsoft released Active Directory along with its Windows 2000 platform. When it comes to the Windows work environment, AD has served businesses well. Tightly integrated with Microsoft Exchange and the Domain Controller, AD empowers IT to authenticate, authorize, and manage users across a wide variety of resources, devices, and apps – as long as everything is centered around Windows. But Microsoft AD isn’t designed to manage Apple or Linux devices (both on the rise). It’s inherently on-premises, which means managing and maintaining servers (both a time and money sinkhole). Compatibility with cloud apps is spotty. Ironically, the very rigidity that makes AD inefficient and ineffective has also been its saving grace: companies perceive it as too much of a hassle to uproot their entire directory infrastructure, even if the transition could yield long-term cost and efficiency benefits. Microsoft is now turning its attention to their Azure Active Directory product. While it purports to be a cloud-based directory, it lacks many of the core functions of the on-premises AD and still requires the on-prem AD when managing Windows laptops and desktops, local applications, and the network. You know the story by now, right? This is when Google steps in, makes an announcement, and saves the day with a better, less expensive, and more cloud-forward option for identity management. But while Google is one of the leading identity providers, they have yet to foray into the directory space. What they have done might be even better. They’ve made a solid infrastructure and allowed it to be customized with APIs. They’ve given third-parties a foundation to build on. So while Google may not be ready to replace Active Directory on its own, they’ve essentially sent out an open invitation to enlist powerful allies to the cause. What Does Google Apps as a Directory Look Like? With a Directory-as-a-Service, there are no servers to manage. Organizations are responsible for adding their users and the software-based service effectively does the rest. The advantages to a cloud-based directory are much the same as the advantages of Gmail or Google Apps. Enhanced security? You read that right. On-premises servers may feel safer, but the facts say otherwise. The cloud actually offers a host security benefits. DaaS not only protects users’ identities through hashing and network security techniques, but it also helps detect compromises of user credentials. Directories are moving to the cloud and will continue to. As they do, one of the principle reasons will in fact be the potential for improved security. While Microsoft’s reign was long, it wasn’t always good. They built their throne on locking out the competition – and in the process convinced themselves that there was no need for innovation. This has made Microsoft’s once unassailable throne, well, a little bit wobbly. Google has already kicked out two of Microsoft’s supporting legs. With the continued development of cloud technology and faster, more decentralized workflows than ever before… it’s now Active Directory’s turn to be challenged.